this phenomenon has dangerous portents for climate change -- parts of the world's largest frozen peat bog in Russia's western Siberia region, which accounts for 60 per cent of the world's peatlands, is undergoing a sudden thaw. The thaw in the northernmost parts of the frozen peatland, over one million square kilometres, is due to rise in global surface temperature, says a team of Russian scientists led by Sergei Kirpoten of Tomsk State University, Tomsk. Because the peat bog stores billions of tones of methane (a greenhouse gas 20 times more potent than carbon dioxide) that would be released into the atmosphere in the thaw, the phenomenon will undoubtedly hasten climate change. Thus, the pristine ecosystem underlain by permafrost has become both a victim and an abettor of climate change. 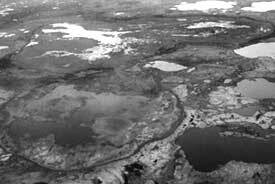 Since their formation 11,000 years ago, peat bogs have generated methane, most of which has been trapped within the permafrost, and sometimes deeper, in ice-like structures known as clathrates. Larry Smith of University of California, Los Angeles (ucla) estimates that the western Siberian bog alone contains some 70 billion tonnes of methane, a quarter of all the methane stored on land surface worldwide. Experts say if the bogs dry out as they warm, the methane will oxidise and escape into the atmosphere as carbon dioxide. If they remain wet, the methane will be released straight into the air. The Russian scientists picked up signals of the impending danger when they observed the sudden formation of a large number of glacial lakes in northern parts of western Siberia. They say this "is undoubtedly connected to the warming of the climate". But they hasten to add that the entire western Siberian peat bog, one-third of India's geographical area in size, is not undergoing similar changes. An expedition to its southern parts failed to provide any convincing evidence of any unusual melting. Western Siberia has warmed faster than almost anywhere else on the planet, with some 3 c increase in average temperatures in the last 40 years, says noted environmental writer Fred Pearce in the August 11, 2005 issue of the journal New Scientist. "The warming is believed to be a combination of man-made climate change, a cyclical change in atmospheric circulation known as the Arctic oscillation, plus feedbacks caused by melting ice, which exposes bare ground and ocean." A study by ucla scientists, led by Smith, which appeared in the January 16, 2004, issue of the journal Science, was the first to highlight the vulnerability of the Siberian peatlands. The paper claimed these could account for anywhere from seven to 26 per cent of the carbon reserves accumulated worldwide. "If released steadily over the next five centuries, this stored carbon could cause a four per cent annual increase over the current rate of co2 rise."